This hack modernizes the control scheme of Castlevania 2 to make it less frustrating to people used to tighter controls as in Symphony of the Night and Mega Man. It primarily allows the player greater control while jumping and on stairs. In addition, Simon now blinks when he has invincibility frames, like in Castlevania 1 and 3. Enables the player to control their x-velocity in mid-air while jumping (including while jump-attacking). When releasing the jump button, Simon immediately starts falling again; this allows the player to make smaller hops if desired. After being knocked back, the player regains control after a split second and can angle their fall. When walking off an edge, the player retains control instead of dropping straight down. 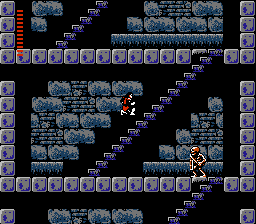 If the player is struck by an enemy while climbing stairs, they will not be knocked off the stairs. This is the same as the behaviour in Castlevania 1 and 3. Simon blinks rapidly after getting hit, as in Castlevania 1 and 3. Similar to the Castlevania 1 hack found here and the Akumajou Densetsu (Castlevania 3) hack found here. Use Lunar IPS to apply the hack to your Castlevania 2 ROM file. V1.2: Fixed softlock during the intro cutscene for the final boss. V1.3: Added (1) a patch for Bisqwit’s retranslation + map hack, and (2) a README file, and (3) byte-level documentation for the hack. 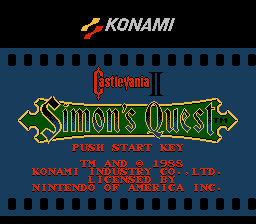 I ran this hack alongside tkempkes Annoyance Fixes (Double Hearts) and your Game Over Penalty Reduction mod in my playthrough of Castlevania II - Simon’s Quest+ here [VIDEO] and together it made for an overall better experience of the game as a whole. The only bug running all 3 is I couldn’t initiate the final boss battle. Simon just continuously walked into the alter so that might warrant some investigation. I chalked it up to a possible incompatibility with tkempkes’s mod. Regardless, the improved controls were a highly noticeable improvement and I didn’t feel bogged down by poor controls on stairs or in mid-air. In fact, it actually made the game much more fun to play.